VTC 900-N | VTC MFG Inc. 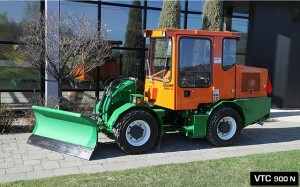 The 900-N is especially designed to effectively clear snow off sidewalks. Combined to a tow behind water tank, the 900-N can be used for your toughest spring cleaning operations. Sturdiness, articulated frame with four-wheel drive, small-size with superior operator visibility and ease of maintenance. These are only a few of the features that make VTC MFG sidewalk tractors reliable, versatile and maneuverable as well as inexpensive to maintain.